Trying to measure corruption is a bit like observing adultery. These are not my words, but I think they are exactly to the point. Indeed, those who indulge in corruption are unlikely to admit it. So when surveying private and public companies in Ukraine, Transparency International (TI) asked how transparent are the companies in Ukraine. This post covers the results of TI’s study. The report evaluated 100 biggest Ukrainian companies: 50 largest state-owned enterprises (as ranked by the Ministry of Economic Development and Trade of Ukraine) and 50 private companies, included in the Forbes top list for 2015. TI tried to assess transparency from three different perspectives: clarity of anti-corruption programmes, transparency of corporate structure, and financial reporting. The study was based on the information that companies have made publicly available, e.g. on their websites. One could say that, at least when speaking about the anti-corruption programmes, the results might be taken with a handful of salt, as the fact that the company publish no programme does not necessarily mean that it has not established one. To address these concerns, TI Ukraine’s analyst, Dmytro Yakymchuk, explains the reason why the organisation chooses to base the studies solely on publicly available information. For TI placing the programme (provided the company has one) in the public domain is a strong indicator of company’s transparency and willingness to send right signals to its partners and customers. I completely agree with this – the corporate websites exist to broadcast important information about the company. If the company has established, but for some reason did not publish the programme, it raises questions about the importance of such program to the company, as well as importance of public awareness about compliance matters. Now, the matter of corporate structure. Many may agree that such trendy descriptions as dynamic and crystalline transparency are voiced whenever discussion turns to anything corporate. 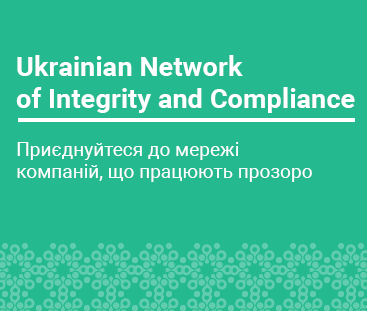 However, have the transparent organisations became a new frontier of corporate governance in Ukraine? Not yet, as the report shows that 62 percent of top companies did not meet transparency standards. Most valuably, TI Ukraine goes further than just providing the outline of the current situation. In its report, the organization puts forward practical recommendations and encourages the companies to commit themselves to their implementation. A transparent and informative corporate website, available in at least one international language, should be the standard communication tool for all companies. It is recommended to create a special portal on the corporate website, or a hotline, for the confidential reporting of corruption or wrongdoing. Apart from publishing the information on a corporate website and developing comprehensive compliance policies, the experts specifically underline a necessity to give the appropriate status and allocate necessary resources for the compliance officer. It is a standard practice that the compliance officer should have a seat at the corporate table, but the experts did not observe this when conducting the study. You may ask what is so important about corporate transparency. It is fair to assume that the role of this feature will not play out the same way for different companies. For some, transparency brings investor confidence, which is paramount for growth strategy, for others – consumer trust and loyalty. For regulators, level of transparency can be a marker for risks consideration when planning inspections and investigations. Ultimately for employees, transparency is a strong indicator that the employer offering them a job is not a shady firm which may ruin their career. It is hard to imagine that these priorities may alter over time, so the commitment to be as open, honest and transparent as possible should remain constant. In a year, with the results of the next survey, we will see whether the respondents will consider and implement TI’s recommendations. I remain positive that they will, so we will have new frontiers of corporate transparency in Ukraine. Tetiana is an investigator at the Business Ombudsman Council. Tetiana came to the team with 5 years of experience with international audit firm, where she was a senior associate and headed Corporate Compliance Practice. In 2015, Tetiana was working at Munich office of international audit firm. Tetiana graduated from law department of Kyiv National Economic University named after Vadym Hetman.